Van véleményed a Do You Really Need That Pill? 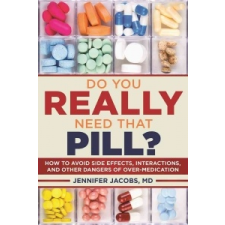 : How to Avoid Side Effects, Interactions, and Other Dangers of Overmedication – Dr Jennifer Jacobs termékről? Értékeld! Tedd fel kérdésed a(z) Do You Really Need That Pill? : How to Avoid Side Effects, Interactions, and Other Dangers of Overmedication – Dr Jennifer Jacobs termékről!